Thinner and lighter â the TK-2000/3000 is ideal for hooking on a belt or even slipping into a coat pocket. The slim design fits neatly in your hand and it weighs only 2039 with the Li-ion battery. This compact, user-friendly portable offers a total of 16 channels, and each can be assigned a QT and DOT tone key to eliminate unwanted signals. You can also assign the 16th channel, if free, to the scan function. This added convenience means that the PF key is freed up for some other function. The side PF key can be programmed for enhanced operating ease, while the adjustable Hold feature doubles the number of functions at your finger tips. The TK-2000/3000 is ready for use immediately after purchase. It comes with all necessary accessories, including a charger, battery pack and antenna. A handy belt clip is also provided. There is no need to buy extra accessories for normal operation. 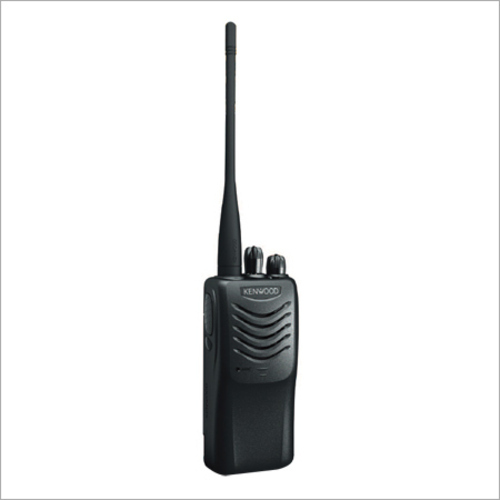 Gvtel Communication Systems are the official distributors of Radio Communication Systems; our wide range of products includes superior quality Kenwood Portable Radios. The entire range of Compact Portable Radios is rigorously tested and audited by our diligent team of quality personnel. Kenwood Portable Radios are made from finest quality raw material in accordance with the set industrial norms meeting the clientâs expectations. These handheld radios are appreciated for their salient features i.e. Compact Portable Radios are popular radios that are widely used in various sectors like airlines, armed forces, environmental departments, and many more. We have an extensive range with varied specifications depending on our clientâs needs. These are equipped with outstanding audio technology and are audited multiple times which results in increase in their demand. All our Portable Radios have a sturdy design, time-out timer and low battery alert feature.